Watermelon Cooler is a really healthy and tasty drink to beat the heat in the Summer. A very easy drink to make and with Watermelon in abundance during summers, getting the ingredients is easy. Takes just 5 mins to make and is a healthy alternative to aerated drinks. Enjoy :) ~ Kamakshi ! Add the watermelon cubes and chilled water into a blender. Blend until smooth and strain the juice ( If you don’t mind, a thicker juice, then you don’t have to strain). Add the lemon juice, mint leaves, black salt and powdered sugar to the watermelon juice and mix well.Add the crushed ice. 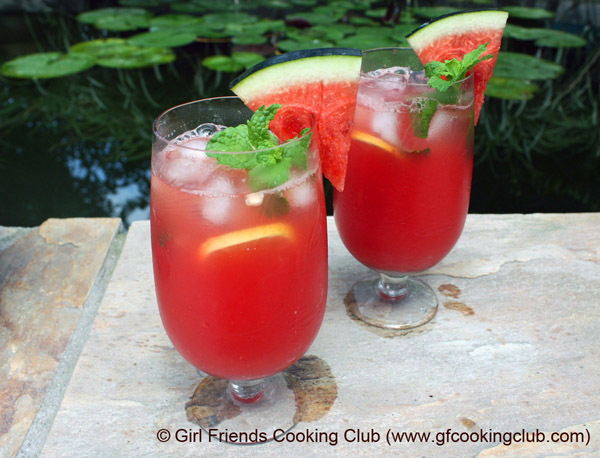 This entry was posted in Drinks, Summer Cocktails and tagged Summer drink, Watermelon Cooler by Kamakshi. Bookmark the permalink.